(CNN) -- Don't believe the hype. 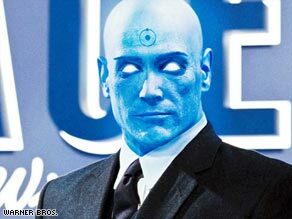 Billy Crudup plays Dr. Manhattan in "Watchmen," the film version of the popular graphic novel. "Visionary" director Zack Snyder, as the marketing would have it, has filmed Alan Moore's "unfilmable" graphic novel by treating the comic book panels as his storyboard and his Bible. Doesn't it bother anyone that this is about as far from the definition of "visionary" as it's possible to get? The visionary sees what others do not see. Snyder -- whose previous films were a remake ("Dawn of the Dead") and another scrupulously faithful comic book adaptation ("300") -- is more in the line of a fancy photocopier, duplicating other artists' imagery with a forger's intensity. A visionary transforms the world. Snyder slavishly transcribes what's set down 5 inches in front of his face. Alan Moore, who has refused to have his name on the movie (ditto its Moore-based predecessors, "V for Vendetta" and "The League of Extraordinary Gentlemen") and who has declined all reimbursement to protest the entertainment industry's fundamental lack of respect for intellectual property, counts as a bona fide visionary. His 1986 comic book is a landmark in the history of the form, a masterpiece of pop cultural angst, filtering Cold War nihilism and disillusionment through the inspired pulp idiom of mundane masked crimefighters and one genuine, possibly radioactive, superhero. With its parallel stories and virtuoso zooming and panning visual tropes, Moore and illustrator Dave Gibbons' "Watchmen" always felt cinematic. You could sense Martin Scorsese and "Taxi Driver's" Travis Bickle in Moore's squalid New York and vigilante anti-hero Rorschach, but proposed movies by Terry Gilliam and Paul Greengrass failed to materialize, foundering on the comic book's sophisticated narrative chicanery. The solution proposed by Snyder and screenwriters David Hayter and Alex Tse is simply to ignore the problem and stick to the text. In fairness, this strategy has proved wildly popular in adaptations of the "Harry Potter" books, for instance, "Twilight" and "300." The fans seem to demand it -- just as there is now a common assumption that a longer, unexpurgated DVD edition is inherently superior to the shorter, tighter theatrical version. "Watchmen" the movie provides ample evidence that more is more, but less might have been closer to Moore in spirit (that is, anarchic, witty and compelling). Clocking in at an exhausting 163 minutes even without some of the book's various subplots, the film forfeits momentum and suspense for a jerky succession of expository dialogue scenes, interspersed with occasional flashes of grotesque ultra-violence. It's all invariably filmed in Snyder's spasmodic, stop-go trademark style and accompanied by a jukebox score that ranges from Bob Dylan and Leonard Cohen to Nena's "99 Luftballoons." On the few occasions where the filmmakers do exercise their imaginations -- in a credit montage relating the glory days of the crimefighters Weegee-style, and in a neat improvement on Moore's climax -- the results are actually ingenious and sharp. iReport.com: Fan underwhelmed by "Watchmen"
Well, see it for yourself, and then compare with the infinitely more nuanced passage in the graphic novel. The considerable limitations of Swedish-Canadian actress Malin Akerman are cruelly exposed as Laurie, aka Silk Spectre II, and if Matthew Goode (playing Adrian Veidt) is the smartest man in the world, then we're really in trouble. Jackie Earle Haley and his "Little Children" co-star Patrick Wilson fare better as, respectively, the angry reactionary Rorschach and mildly conflicted Dan Dreiberg, while it's hard to take your eyes off Billy Crudup's naked blue avatar, Dr. Manhattan -- for various reasons. Snyder flunks that test. Yes it will hit the box office like a tidal wave, but ultimately the numb, enervating "Watchmen" is living on borrowed time. No smiley face here. "Watchmen" runs 162 minutes and is rated R. For Entertainment Weekly's take, click here.